Sometimes the cause of a limitation in the ability to ambulate is not obvious, and may actually be difficult to determine. Walking is a complex phenomenon, with thousands of changes occurring with each and every step. The ankle must bend a certain amount, as must the knee, and some of the motion that occurs is not as simple as a hinge-type joint like those. The foot moves in all three planes of motion, up and down, side to side, and turning in and out. Problems with how the foot is working, which is the foundation for body mechanics, can produce all sorts of problems with gait. THE BIG TOE JOINT: An interesting example of this kind of pathologic change can be seen in the big toe joint, which, it so happens, is a critical part of the ability to walk. When a person takes a step, there is a point at which the heel comes up off the floor, as the body is passing over the stationary foot. A certain amount of motion at the critical big toe joint is required to walk normally. What happens when someone can’t bend that toe sufficiently? The problem of a stiffened joint at the base of the big toe is termed hallux rigidus (hallux = big toe), and can develop for a variety of reasons. MECHANICS OF THE BIG TOE JOINT: You would think that such a situation would be a noticeably painful one, and, indeed, it can be. This is a unique joint, with an usual mechanism of motion, in which the big toe will “slide and glide” up over the metatarsal bone. To do this properly, the metatarsal bone must be in the right position. If it is not, the base of the big toe will tend to jam into the metatarsal, causing the gradual development of wear-and-tear arthritis. Early in the development of a stiffened big toe joint, abnormal motion of this joint will cause stress to various structures including the ligaments around the joint, the covering of the joint, even tendons running over and under it. These can all become inflamed and sore, causing pain in the process. THE KINETIC CHAIN: As stated earlier, pain during gait will alter how someone walks, although the sufferer may be completely unaware that changes are occurring. They maycompensate by turning the foot outward, or perhaps shortening their stride length. But this tends to be a temporary phase, with acute pain from the joint resolving over the years as bony changes occur. This will often result in a change in the shape of the two bones that come together to make up this particular joint. This often produces one that can physically not move, even if the foot is off the ground, and one grasps the big toe and attempts to move it. Generally, this change is accompanied by the growth of extra bone around the joint, and may include the development of spurs pointing away from the joint. Surprisingly, because the joint is stiff, it is no longer painful, and ceases to be of concern for the individual so afflicted. It is at this point that some interesting, yet unfortunate, changes tend to occur. Because of this structural reduction in big toe joint motion, normal gait is impossible. Other changes must take place in this situation. Some of them are anything but obvious, but it is critical to understand that there is a very specific connection between all the parts of the “musculo-skeletal” system. Any defect which is lasting, and present for years, will cause compensatory changes somewhere else. Researchers have found that a stiff big toe can lead to jaw pain or chronic headaches! In the human body, nothing operates independently, and on its own. It is one system, and all the parts are interconnected. This is the basis for the term “the kinetic chain”, which describes how various structures that are part of this bone-muscle-ligament system, affect the other parts. DIAGNOSIS: Diagnosing this kind of problem can be difficult, especially considering how fragmented our medical care is. For example, an oral surgeon, when confronted with someone who suffers from recurrent jaw pain, is unlikely to recognize that the source is the big toe. A physician specializing in body mechanics is more likely to, but how many people examine their big toe motion, and seek out an appropriate doctor? Evaluating motion of this joint is certainly something a podiatrist should do on a regular and routine basis. TREATMENT OPTIONS: When someone presents with pain in this structure, many things can be done to relieve the discomfort, from anti-inflammatories, to various wraps and braces. Even using a stiff-soled shoe will help. But this is a chronic and enduring problem, usually a result of foot architecture that functions poorly, and either their structure must be changed, which means surgery, or we must improve their foot mechanics. 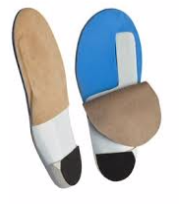 The latter is best achieved with a specialized, in-shoe foot brace, termed foot orthoses. These can be tremendously beneficial when correctly prescribed, and don’t have the potential for complications that come with most surgical procedures. Fabricating an effective orthotic device is a complex and tricky process, but can sometimes prevent the degenerative changes which can go on to destroy the joint. That’s called preventative medicine, which is something our medical system needs to do a better job of. SURGERY: A variety of different surgical procedures are used to treat this problem. Some are more complex than others, and require a very different kind of recovery period. Much of the decision-making process is dependent on the condition of the joint, as well as the activity level of the individual. Someone who wants to run marathons will have different expectations than someone who needs a walker to get around. The take-home message is that there is an appropriate treatment, and procedure, for everyone, if conservative methods do not relieve the pain and degeneration of the joint sufficiently. Take care of your foot mechanics, and you will be helping to prevent more severe problems in the years to come. So save your joint, and save your cartilage: you’ll walk better as a result!